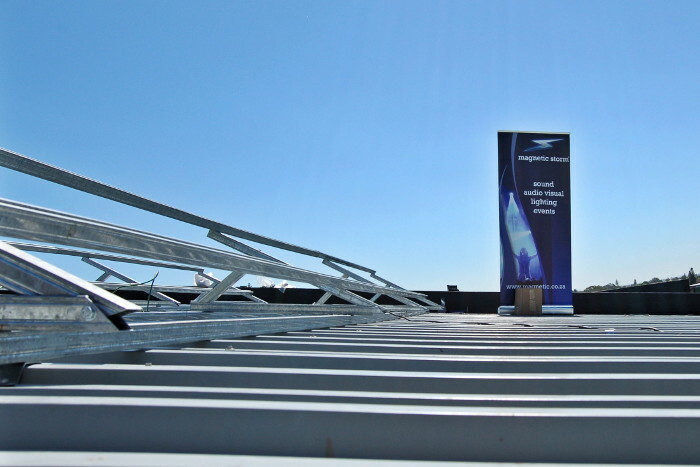 The first phase of a two phase project Solar Photovoltaic System installed by Straton Solar at Magnetic Storm is a 7 Kw Hybrid system which offers Grid Tie and Battery Backup for essential circuits such as Servers, Desktop computers and lights. Technical details are that the system is a Conext XW+ Grid interactive inverter from Schneider Electric which Straton Solar are the sole Eastern Cape Distributors for, along with 20 250 W Yingli Solar Panels, mounted at 30 degrees, with 495 Amp Hours of 48 Volt battery backup. The system will supply Magnetic Storm with power from the grid, from the solar panels, from the batteries and from the optional generator. On present load the installed battery backup will give Magnetic Storm 5 hours of backup – more than the worst case load shedding projections. This backup projection is based on draining the battery bank to 50%. The installation is projected to generate 6 876 KW Hours per annum. This is a direct savings off of Magnetic Storm’s electricity consumption account of R11 613.56 for the first year at present electricity prices of R1.689 per unit. The solar installation is monitored online and Magnetic Storm will be able to see at a glance Energy Imported and Exported, peak power for solar generation and the peak load power on the system. The installation replaces a 6.5 KW generator and brings benefits such as: no noise, savings on petrol and maintenance, a faster one second delay between loss of electricity and battery power kicking in, no storing or transport of flammable liquids, less consumption of fossil fuels and being locked in to a much lower electricity price over a projected life of 25 years. Further benefits from a business perspective are an accelerated depreciation allowance of 50% in the first year, 30% in the second and the balance of 20% in the third year. 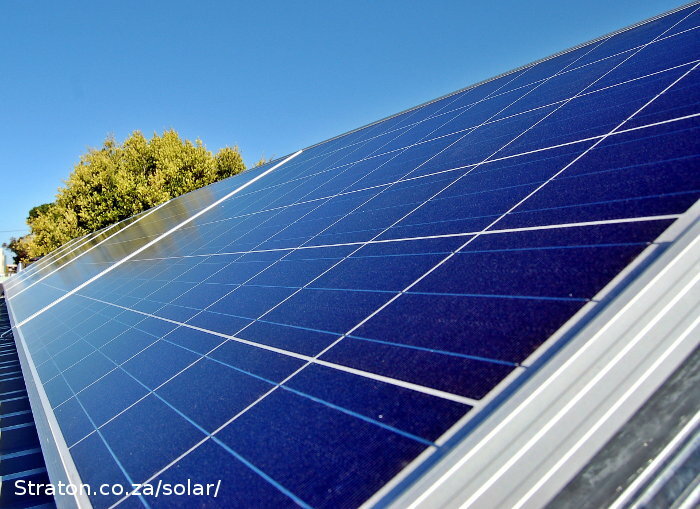 At present the Nelson Mandela Bay Municipality is streets ahead of other local municipalities as it is the only one allowing grid-tie and net metering on a 1-1 basis. In other words if your electricity costs you R1.689 per unit and you generate one unit then you are credited the full R1.689. Careful matching of electricity usage to the solar power plant will ensure that all grid-tie systems installed result in a zero electricity consumption account. At present any excess energy that is generated is ‘lost’ to the grid and not credited to the account, although NERSA has recommended to ESKOM that grid tie owners should be allowed to ‘bank’ up to one year of excess energy generated and fed back into the grid. A specific municipal meter is installed that will report the energy generated and consumed. This hybrid system is Phase 1 of Magnetic Storm’s green drive. Phase 2 will see the installation of a 25 KW pure grid tie system with 27 KW’s of solar panels with a projected yield of 41 518 units per annum. Over a projected lifetime of 20 years this system represents a cost per unit of around 60 cents per unit – a compelling case when compared to the present per unit price of R1.689 per unit and the fact that this price will be locked in until 2035. The electricity price per unit at only 8% escalation per annum is projected to be R7.87 per unit in 20 years time. Over the life of the system Magnetic Storm will self generate over 830 Megawatts of power, representing a potential saving R2 685 880.69 in electricity consumption. The clean power from this installation will save 498 240 kilograms of carbon dioxide from entering the atmosphere and, in the process, save 47 748 trees. Magnetic Storm are making the right decision based on hard cold numbers and being Environmental Champions.